I am now persuaded he was speaking of a singular great egret who has indeed stepped far away, from the water. I have been seeing her (or him) around the Park for months. 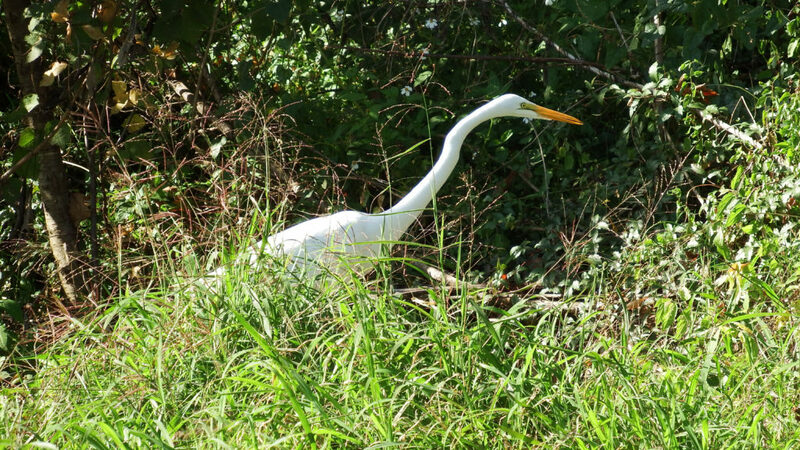 One lone great egret wandering through the grass and poking her head into shrubbery. I cannot tell you how strange this is. Great egrets are shore birds. They hunt in the water. 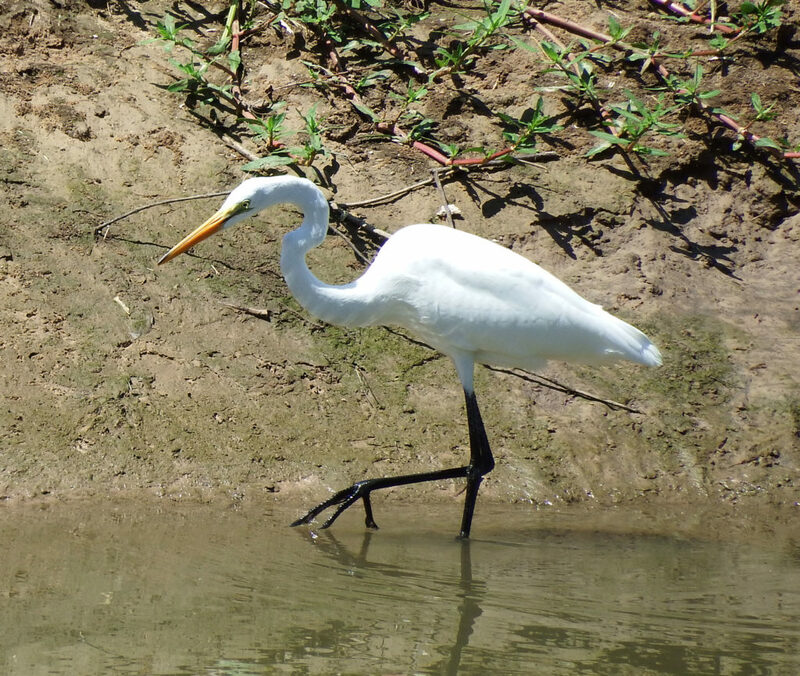 Probably every great egret you’ve seen (and you almost certainly have seen one), had wet feet. This is a normal great egret. Notice the location of her feet. Not a normal great egret. Notice the position of her whole being! Our rebel might, from time to time, hunt in the water. But she also hunts on land. And that is mighty weird. 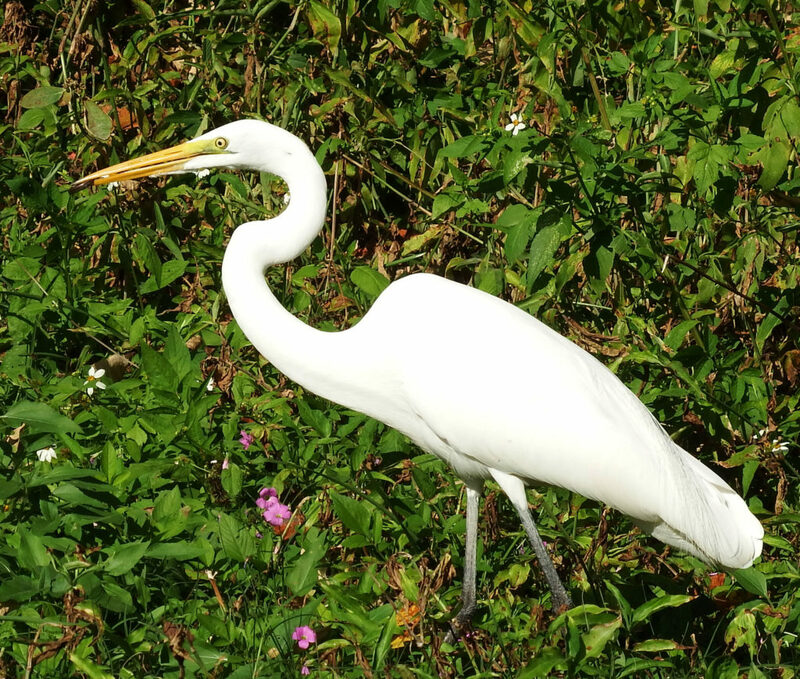 A great egret’s diet is mostly fish and other aquatic critters. The only references to land-feeding great egrets I could find involved birds that lived away from a body of water. 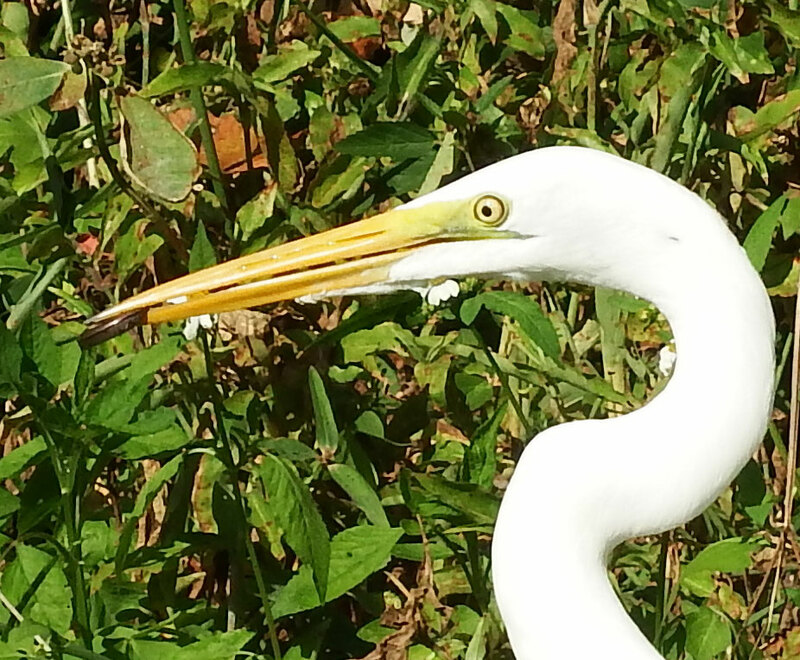 Our Park is named for a body of water, and yet this great egret chooses to hunt on land. I have tried and discarded three theories about why she hunts on land. I do not have a fourth. However, this is not a juvenile bird. She is at least two years old. You can see in the photo below that this bird still shows traces of her breeding plumage. Many birds, as they enter their breeding season, will develop special plumage and coloration. Among great egrets, breeding plumage involves wispy feathers along the back and the skin between beak and eyes gets a lovely shade of blue-green. This bird still has some facial color and you can see a fancy feather still visible dangling near her tail. 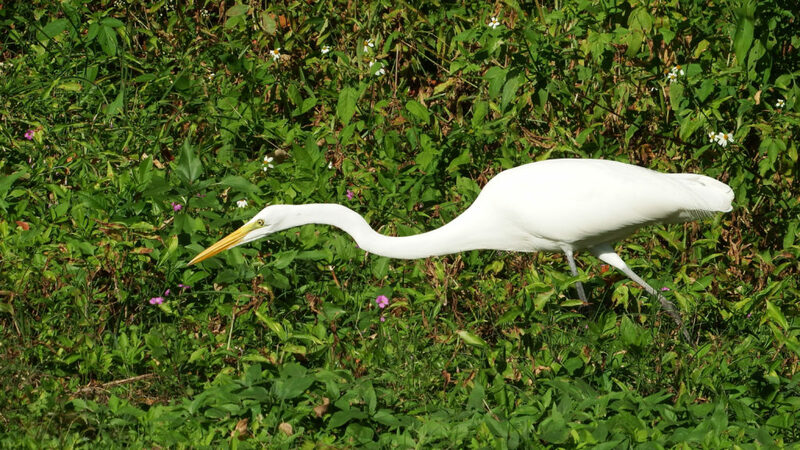 Since great egrets don’t start to breed until they are two or three, this bird is older than two. When I first started seeing the bird, I thought there might be a reason other than hunting that she was frequenting the grassy areas. I couldn’t think what that reason might be, but I knew that egrets hunted in the water, so I imagined she must be after something other than food. On Monday, I watched her for over 20 minutes and saw her catch and eat prey more than once. I have to apologize to my readers because when she caught and ate a five-inch snake, I was looking through my binoculars and not my camera, so I can’t show you that. However, I did get a photo of her with a smaller snake or maybe a skink. She’s got something tasty in her beak. This is a close-up of the photo at the top of the page. Great egrets have a number of hunting postures, the one our friend used over and over is a stalking pose where she holds her neck, stretched out, parallel to the ground. She adopts this posture when she has spotted prey. The next move is a stabbing lunge, followed by a swallow if the lunge was successful. In the photo above the one above, you can see the stalking posture. I entertained this notion for a brief moment. But there is no seeming shortage of fish in the bayou. I have recently seen a snowy egret and a great blue heron feeding; last week, I saw cormorants chowing down on fish. I have, however, noticed the almost complete absence of black-crowned night herons in the Park. They might have been over-represented around the bat bridge when the bats and the cliff swallows were breeding and it is perhaps normal for them to be elsewhere in the winter. But their absence is reason to at least pay attention. And now, I am out of theories. Our great egret simply marches to her own beat and keeps her feet dry doing it.